Super by Matthew Cody. Sequel to Powerless. Review: Do you love fantasies and wish you could have super powers? Then you have to read Super. 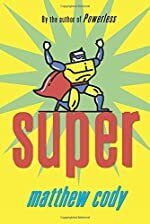 The book Super by Mathew Cody is a terrific book and one of the best I've ever read. I loved the book! Mathew Cody also wrote the book Powerless and if you have ever read that book, Super is the sequel to that book. Although Powerless is a Fantastic book, I'd have to say Super is even better! The book is called Super because all the characters have super powers. Eric, can fly and has super strength. His friend, Rohan, has super senses. Daniel, the main character, doesn't appear to have any powers that come naturally to him, but can he steal powers? Super was well written and had many magnificent qualities. For example, as you read the book, you experience many different emotions and really care what happens to the characters. I found myself thinking: "Wow, what if he gets hurt?" or "I was really not expecting that!" Also, this book has many complications like defeating their enemy once again, deciding who to trust and what to trust them with, trying to stay united as one and agreeing with each other instead of fighting and arguing. Also, all the kids, Daniel, Eric, Rohan, Luisa, and Mollie, go on a journey to end the Shroud once and for all, but are they able to? All of these different twists and complications make the book even more exciting and very hard to stop reading! Overall, I give Super 5 stars out of a possible 5 stars. I loved this book and recommend this book to anyone who is between the ages 8-15. This is because this book doesn't have any bad language or hard words that an 8 year old wouldn't be able to understand. Also, since it is so exciting, kids up to 15 years old wouldn't find it boring. To find out more, Read the story Super. We would like to thank Random House for providing a copy of Super for this review. Have you read Super? How would you rate it?